NZBcc version 0.8.2a released! 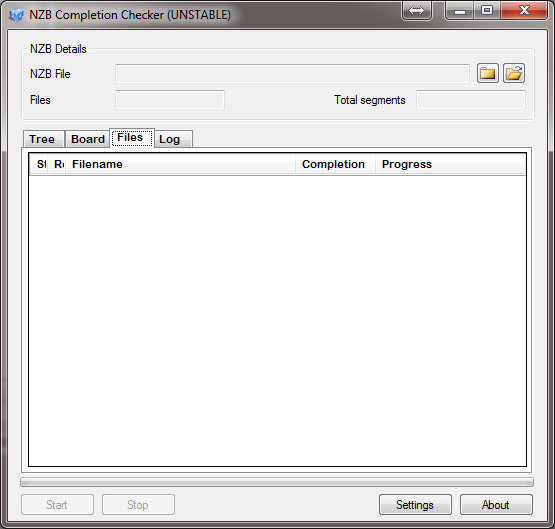 | CODExperiments	NZB Completion Checker alpha release download now! Yes, it’s true! A new version of NZB Completion Checker has been released 🙂 Howver, this is just an alpha release, so there might be bugs – and most likely are! This new version brings some new features, which should please most people! Notice the two file selector buttons and the batch tab. The first buttons allows you to select files, and the other button folders. The Batch-tabpage shows all the files to be processed, and their currenct status. When a file has been processed, just click it, and the completion report will popup! All of the current features of NZBcc, such as SSL, NZB splitting and so on, also works during batch processing. For those people have problems connecting to their Usenet servers, a log-tab has been added. If there is a connection error, it will be printed here. During the alpha release, other debugging messages might be printed there too! A new kind of file validation has been added. Its a tiny bit slower, but should work on all servers, producing a 100% correct result. It turned out, that the previous validation method could fail on some servers, making them report the file as present when in fact it was missing! This is not a bug in NZBcc, but in some Usenet server software. The new method has been selected as default for new users. Old users should switch to the new method! A few bugs was fixed, and an entirely new batch was introduced I guess 🙂 As always, please report them if you find any! Version 0.8.2 Alpha can be downloaded from here. This entry was posted on Friday, November 4th, 2011 at 12:03and is filed under . You can follow any responses to this entry through the RSS 2.0 feed. You can leave a response, or trackback from your own site. Found the first error… how it ever passed the final check I don’t know! But checking just one file, seems to be a problem. The check never starts. Quick fix – add another small nzb file, and the check will start! An update will be posted ASAP! Good stuff. Nice to see SSL enabled. Tested a few files… looking good!. Thank you sir. Hah, right after I comment, I found an exception. While running the checker, left click on the second column and you’ll receive a System.ArgumentOutOfRangeException. Not sure the column name since it’s locked from expanding. Let me know if you want more info. When I check a file it always stops near the end (98%) and doesn’t complete. This has happened on version 0.5. 0.7 and now 0.8. I’ve never been able to complete a file check on any version. I’m on Windows 7 x64 and using astraweb. Any ideas? 1. Only run with one(1) thread. Does it complete the check now? 2. Check the log-tab (0.8.2) – see anything? 3. Go to the Tree tab. Unfold the nodes (double click). When the check freezes at ~98%, do you see any of these icons? Just noticed this. I’m still on version 0.7 btw. My comments before were on that version as well. Just noticed there’s a newer version lol. About Callum’s issue, I never had that problem, not once. I think it’s to do with Windows x64 maybe? Not all SSL servers are 443 ?? For SSL connectivity you would want to have the users use ports like 563 80 and 81.
my usenet provider runs non-SSL on port 443 and SSL on port 563. could you please update that? it would also be very useful to permit the entry of multiple providers. if I test an NZB and get an unacceptable completion, I may decide to test with another provider. ignoring the fact that I need to re-enter all of the server and credential details, your application only checks the account details when it is launched. if i stop the check, change the server details and click on start again it uses the previous credentials. the speed of checking is also very slow. typically i can download the entire file from my provider in less time than it takes to perform a completion check. validating a several gig file might take in the order of 30-40 minutes. i can easily download it in less time. this is using STAT checking only. article headers take significantly longer. i’ve tried using up to 50 connections (which helps) but still is very slow. if it helps – i’m running windows 7 32 bit with a quad core Q6600, 4GB of memory and a 30Mbps cable service. i can saturate my link with 20 connections to my provider (blocknews). it takes me roughly 30-40 minutes to download a 4GB file. is the speed issue to do with my provider? i originally ran version 0.7 and now using 0.8.2a of your software with no difference. A few other users have reported speed issues! I have not been able to reproduce the problem, which makes me think, that it might be the provider that has some problems – possibly with their file index. I made a special version just for you (and everyone else who reads this post!) 🙂 This version will time every connection made to your Usenet server. It will display the time on the log tabpage. You should only test this with 1-5 threads. This should give you an indication of the speed of your server. The timer starts when the check command has been transmitted to the server, and it stops when the response comes back. AND… you should be able to change the SSL port to any port you like! I have not tested this, as Giganews always use port 443! Again, this is a debug release. It’s just like 0.8.3 apart from what I have just described. The extra logging will slow it down a bit.